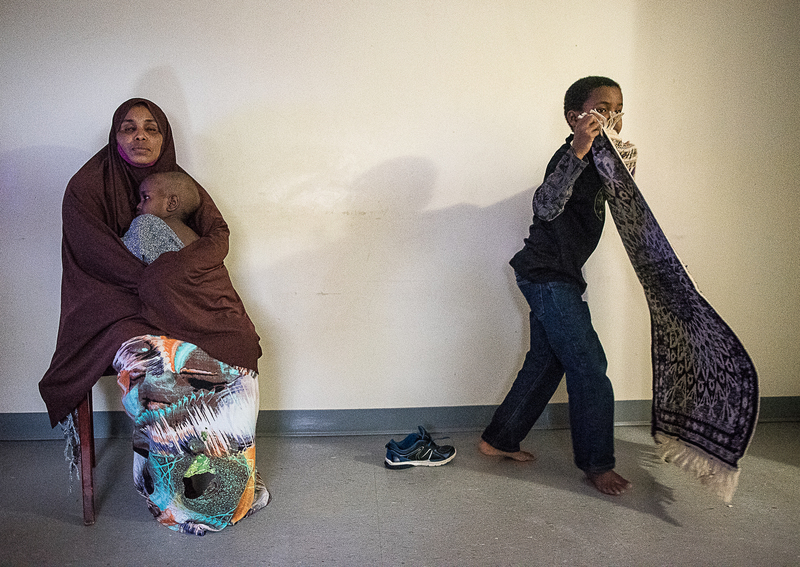 LEWISTON —”Kadra Ahmed” already had four children when her youngest son was born. She knew a healthy child from a sick one. Her baby was a few months old when he started crying incessantly. He seemed constantly irritable, wouldn’t eat. As he grew older, he struggled to walk. He didn’t talk. He didn’t sleep well. Ahmed quit her job to care for him. A routine blood test, done at his doctor’s office, told why. “They came to me and said, ‘Your son has lead poisoning,'” Ahmed said. The family was living in an apartment on Bates Street in Lewiston. Lead was common in the downtown buildings. After years of attention and millions of dollars spent on mitigating problem areas, lead paint continues to chip off walls and fill the air with fine lead dust. 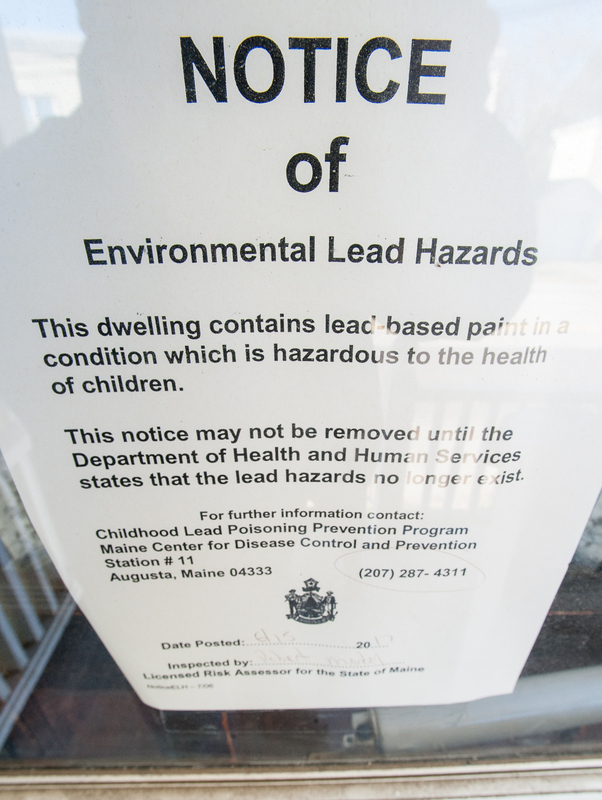 Lewiston remains the worst area in the state for lead poisoning. While lead is a potential problem for all children, it can be particularly difficult for new immigrant families to deal with. Parents usually have no knowledge of lead before they move into the city. They don’t know their rights when renting an apartment that could have lead. They fear speaking up, even when their child is sick — sometimes especially when their child is sick, because they don’t want to look like they can’t take care of their children. The New Mainers Public Health Initiative, a Lewiston nonprofit created in 2014 to help immigrants and refugees with health issues, has encountered child after child damaged by lead poisoning. No firm numbers are available, but officials with the group feel the problem is pervasive. “You see in every family there is one child who is acting weirdly in that family and if they test for lead it’s always high,” said Sahal Jimale with the New Mainers Public Health Initiative. While city leaders and health professionals work to keep all of L-A’s youngest residents safe in their own homes, some renters say it’s not enough. Hundreds of apartments are being made lead safe, but thousands remain potential hazards with no solution anytime soon. Ahmed’s family moved, but it was too late. Lead was commonly added to paint in the past century for durability, color and faster drying. It coated doors and windowsills, stairs and banisters, inside walls and the outsides of homes. The federal government banned the consumer use of lead paint in 1978, but by then it had been in use for decades and covered millions of houses and apartments. As paint deteriorates — chipping, peeling, cracking or dampened — lead becomes a health hazard. Babies crawl on floors peppered with lead paint dust and then put their hands in their mouths. Teething toddlers gum painted windowsills or eat flakes found around the house. Children play outside in lead-contaminated dirt or breathe air filled with lead dust that someone released by opening a window, walking upstairs or sweeping the floor. In children, even very low-level lead poisoning can impair development, intelligence and learning, stunt growth and damage hearing. In 2015, Maine, following national standards, lowered the level at which a person is considered to have lead poisoning. Today it stands at 5 micrograms of lead per deciliter of blood, down from 15 micrograms. Advocates, however, say no level of lead is safe. The older the home, the more likely it is to contain lead paint, and a lot of it. Lewiston homes, especially downtown apartments, skew old. Between 2011 and 2015, according to the state, an estimated 241 Lewiston children 3 years old and younger had lead poisoning — almost 8 percent of those tested. That’s more than any other place in the state, including Portland, Maine’s largest city. Auburn added an estimated 92 children during that time, making L-A’s total even greater. In 2015 alone, Lewiston-Auburn accounted for nearly 18 percent of the state’s lead poisoning cases for children 3 and younger. The area’s high rate has concerned people for years. Multiple organizations have spent years and millions of dollars on the problem, but lead-abatement workers are few and the work they do is time-consuming and expensive. And many homes have lead. “I think that we’re moving where we need to. It will take a long time to get rid of all the lead paint,” she said. Lewiston and Auburn received their own $3 million federal grant three years ago, money that helped make 207 housing units lead-safe and is expected to help 34 more by the end of the year. This past summer, the Lewiston-Auburn Lead Program got another $3.4 million from the federal government for lead abatement, money that will help hundreds of homes and apartments in downtown Lewiston and Auburn over the next three years. The problem? City officials estimate that 9,000 units are in need. “So I’ve got, like, a hundred years of work at this pace,” said Travis Mills, manager of the Lewiston-Auburn Lead Program. Within Lewiston, the highest lead rate is downtown — an area filled with 100-year-old apartment buildings and poor families with young children. Some residents are native Mainers, others are first-generation immigrants. But while lead can affect anyone, new immigrant families have a especially hard time dealing with it. When families first move to Lewiston, they often don’t realize lead is a problem, so they don’t ask about it when considering an apartment. Parents may not speak the language or understand their rights when it comes to lead abatement. They fear if they speak up about a sick child, it will look like they can’t take care of their family and their children will be taken from them. Even if a child is diagnosed with lead poisoning, parents may avoid the early interventions that could help with developmental delays and cognitive problems because they don’t want their child stigmatized. That leads to even bigger problems in school. Officials with the New Mainers Public Health Initiative believe Lewiston’s schoolchildren are too often diagnosed as having autism, attention-deficit disorder, behavioral problems or other issues when they’re actually suffering from the effects of lead poisoning. “I can’t answer that with any hard data, but I have no doubt that exists,” he said. Lewiston spends more than any other school system in the state on special education. In 2015-16, a full quarter of the Lewiston School Department budget — $15.9 million — went to special education. In comparison, Portland spent $13.8 million, about 14.5 percent of its budget. While Webster said lead doesn’t account for all special needs, he believes it’s a factor. Ahmed, who asked that her real name not be used, moved to the United States on Jan. 1, 2015. She was from Somalia and had been living with her husband and four children, now ages 9 to 18, in a refugee camp in Ethiopia. Her husband is still there, waiting to come to the U.S.
Ahmed’s youngest son was born not long after the family settled in Maine. He was healthy, they were living in an apartment on Bates Street, everything seemed fine. When he was a few months old, he started to get sick. “Since then, he is still now sick,” Ahmed said through an interpreter. The family left the Bates Street apartment for a lead-safe apartment on Knox Street just over a year ago. His lead levels have dropped, Ahmed said, but the damage is done. At 2 he doesn’t walk well, won’t eat much and speaks only a word or two — one of them “Mommy.” He seems especially irritated by lights, covering his eyes and crying if they’re too bright. He’s anemic. Ahmed was called home so often that she had to leave her job to care for her son. She’s found it impossible to get a baby sitter willing to care for a sick toddler. Ahmed has no idea whether he’ll get better. She worries about his future. Ahmed said she, like so many others living downtown, had no idea about lead when she moved into the city. Immigrant groups and health care providers have worked to educate people about lead. Word has also spread among the downtown community — some of whom believe too little is being done to address the lead in their neighborhoods. A representative from U.S. Sen. Angus King’s office, touring the area for National Public Health week, took the brunt of residents’ frustrations as the closest government official. Government officials and public health groups say they’re working on the lead problem as fast as they can. And they have made progress. More Lewiston-Auburn babies and toddlers are getting screened for lead, up 18 percent, from 580 in 2003 to 686 in 2012, the last year those numbers are available. Statewide, lead poisoning among infants and toddlers has plummeted, from 1,189 cases in 2003 to 314 in 2015. Lewiston-Auburn’s numbers have gone up and down during that time, but the cities saw a dip from 2013 to 2015, the last year figures are available. When a child tests positive for lead, doctors must notify state health officials, who then order an inspection of the child’s home. If lead is found, according to new state rules, landlords have 30 days to take steps to correct the problem or face penalties of up to $500 per day, per unit. That has helped spur Lewiston-Auburn building owners to take action. The Lewiston Area Public Health Committee is discussing new rental regulations that it hopes to present to the Lewiston City Council at some point. The proposal is still forming, but based on their research into other cities, members say a new policy could require landlords to pay to register their rental units, with that money funding local lead inspections. Lead-safe units could be noted on the registry, helping tenants and landlords find each other. But even with the progress, problems remain. Lead inspectors currently post notices on apartment buildings that have tested positive for lead, but landlords or tenants sometimes pull them down. Building owners are required to disclose lead hazards to tenants. However, many tenants don’t know that. And even if they’re handed a technical lead report, they may not understand it. Lead abatement is expensive, so landlords often apply for one of the grants available to them. But even if they get that help, few contractors in Maine are trained to do the work and their waiting lists are long. 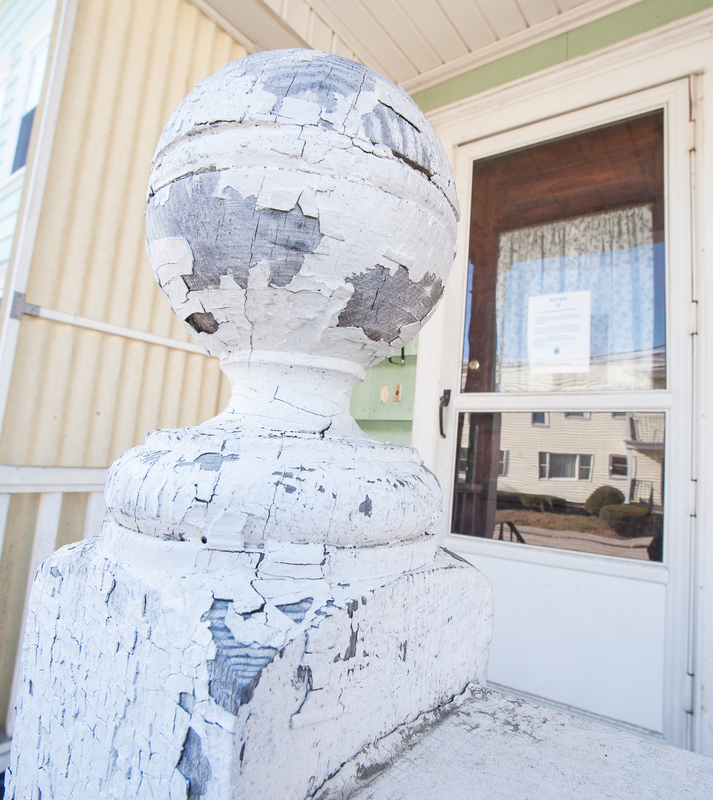 “Personally, I can tell you if I have an application that comes in right now and everything looks good to go, it’ll probably be six to nine months before somebody shows up at the apartment and fixes it,” said Mills with the Lewiston-Auburn Lead Program. In the meantime, tenants are not required to move out. And while one Lisbon Street landlord, local legislator Bettyann Sheats, decided on her own to put her tenants up in a hotel for two months while she waited for workers to deal with lead in the building, such a move is unusual. The Maine State Housing Authority and the Maine Department of Health and Human Services created an online search tool for people looking for rentals. In a search this week, the site listed 34 Lewiston apartments that were lead-safe or completely free from lead paint, but only five were actually available. One of the five was reserved for seniors only. Two took Section 8 housing subsidies. Even when a unit is made “lead-safe,” that doesn’t mean it’s lead-free. In abatement, lead paint is typically painted over. That stops lead dust and paint chips, but as soon as the area is damaged — a scratch on the wall or a nail hole, for example — lead becomes a problem again. That leaves downtown residents anxious. After the Lewiston-Auburn Lead Program announced its latest $3.4 million lead-abatement grant, the head of the New Mainers Public Health Initiative reached out to city officials. I hope, he said, this means we’ll see improvement. Lewiston-Auburn Lead Program and New Mainers Public Health Initiative leaders have met a couple of times since to discuss the lead problem and what’s being done. Both sides agree lead is a problem that needs to be solved. Maine State Housing Authority officials have estimated that more than 350,000 homes built in Maine before 1978 may contain some level of lead paint, almost half of which were built before 1950 and are likely to have high levels. U.S. Census data shows nearly 30,000 Maine children under 6 are living in homes built before the 1950s. Five areas — Lewiston-Auburn, Bangor, Portland, Saco-Biddeford and Sanford — are responsible for 40 percent of childhood lead poisoning in Maine. In those areas, according to the Maine Center for Disease Control, more than 80 percent of lead-poisoned children live in rental housing.